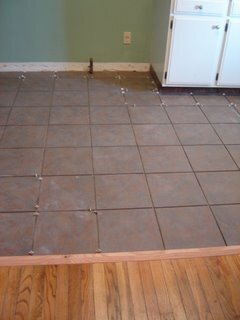 This year for Christmas I asked for my dad's abilities and tools to come to my house and help me lay tile in the kitchen. Here is the progress of our efforts over the last few weeks. I'm ready to get my stove back in place so Laura and I can eat meals again! 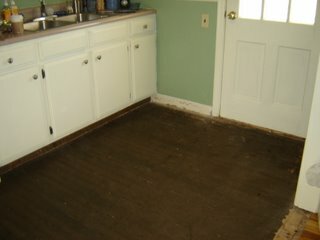 I got busy one night ripping up all of the old floor to get to this tar paper layer. Only two layers of linoleum to scrap off. Here is the man at work laying the hardibacker board. I was allowed to use a cordless drill and put some of the 36 screws/board into the floor. I started to get a blister on my thumb, so I used my bike glove to cushion my hand. 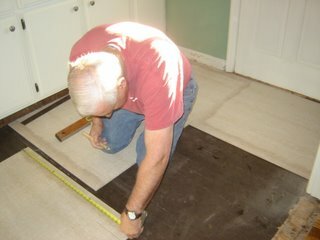 After waiting for the cement to dry, we began laying the tile. I did the one's in the center that didn't need cut. Dad came this past Saturday and cut the rest. The grout is done! The fun clean-up starts. 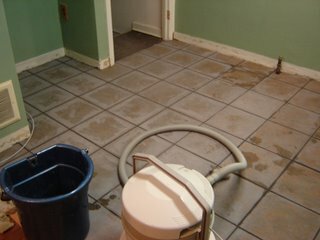 I have washed the floor about 10x trying to get the residue up from the tile. We just have to seal the grout line, glue the trim back on, cut and stain the transition pieces, put in a new threshold on the door, and clean the floor one more time. I definitely have a new appreciation for the tile laying process. Now the cabinets and counter tops look dated next to the floor, I guess that will be next year's gift:-)!! !